The Life of Bon: Let the Evening be in charge for once! We've got a couple of winner around these parts. Lots of giveaways means lots of winners! The winner for the $50 Forever 21 gift card is Samantha Tedesco. We will be emailing you shortly! The winner for the $20 Target gift card is Ellie Wright. I will forward your info on to the people at PEOPLE (now that got deep) and they will be in touch with you. CONGRATS TO YOU BOTH! Saturday night I found myself all by my lonesome. Hubs had a read through for a film and an important production meeting. I thought about calling up a friend like I often do on nights alone- thought about quickly and desperately trying to fill any and all empty space. But then I thought better of it. I decided to give this night to myself, to catch up on stuff I needed to do- which included a little bit of R&R. I feel like somehow in our society we have told ourselves that quiet time, that slow, peaceful hours are for the birds. We must be busy, we must be productive, and we must constantly surround ourselves with people. So here I was. Staring at a Saturday night all by myself. I decided to not schedule too much work, but to let the evening take me where it may. Interestingly enough, the evening took me for a nap. I woke up about 7 feeling strangely refreshed and relaxed. "Alright, evening! Where to next?" I asked. Target is dangerous. I avoid it like the plague for the simple reason that last time I went in for a birthday gift I came out with $200 worth of clothes and no birthday gift. Hence, no more Target for Bonnie. But as Evening was in charge, I decided to let him take over. We ended up in Target and I strolled around and got quite distracted in the swimsuit apartment. Thirty minutes and several unsuccessful swimsuits later (why do I always look so awful in a swimsuit in March? Curse you, winter!) , I was on my way to the checkout with nothing but a good old fashioned magazine in hand. Success! I only spent $5 in Target! Sorry about the bluriness. It is beyond awkward to take a picture in a grocery store aisle when there are people behind you. Let's just say I did it quickly and without much focus on well... focus. "Evening! The nap was divine! Target was liberating! Where to next?" That's when I discovered the evening was a genius. 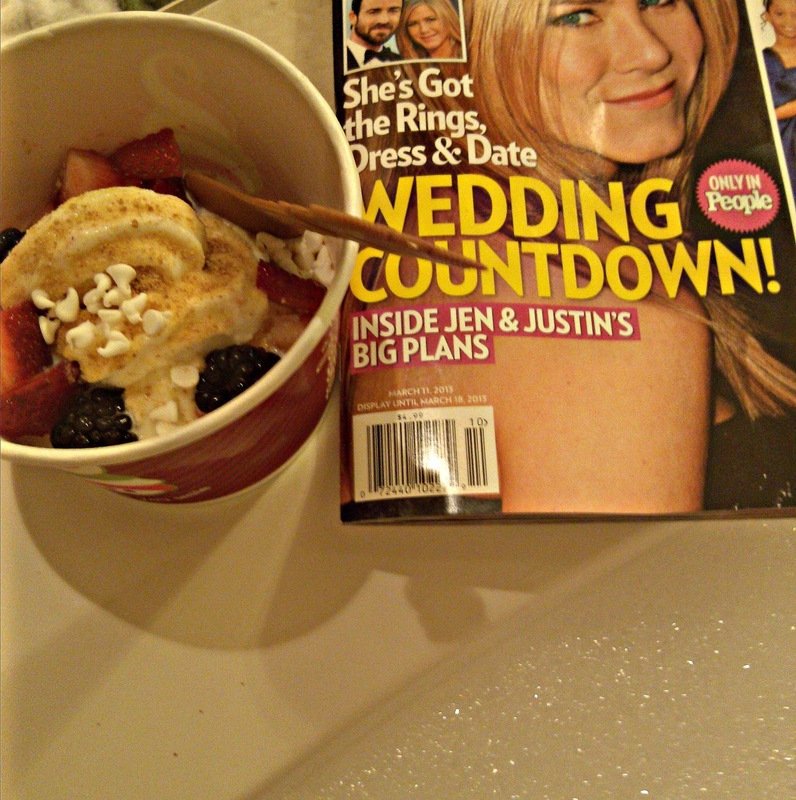 At home, with my guilty pleasure PEOPLE Magazine reading and a little frozen yogurt, Evening whispered one last thing to do that would make this night beyond complete. "Bubble.... bath...." He whispered. And that was how I found myself covered in bubbles, chowing down on frozen yogurt, and indulging in all the Oscar's greatest moments at 8:00 on a Saturday evening. PEOPLE Magazine 2013 Oscars Double Issue didn't disappoint. They had every angle of every gown you could imagine. And bracelets and updos and all of that incredibly important Oscar stuff that boys aren't even smart enough to care about. I carelessly flipped the pages, reveling in the gorgeousness of the stars, and the warmth of the bathtub and thought to myself, "Evening. You have been beyond good to me." "What'd you do tonight?" he asked. "Nothing." I answered. The truth has never felt so good. I recommend this. Letting the evening be in charge for once. Letting it take you where it may. To let go of worries and stress and allow yourself to totally recharge and relax. I hope your evening leads you to a copy of PEOPLE Magazine and I hope it's the Oscar edition even more . I hope your evening lets you buy frozen yogurt and I certainly hope your evening ends up in a bathtub with not a care in the world. It's a good life, isn't it? Sweepstakes Info: Test your PEOPLE Trivia skills for a chance to win! Enter each week for a chance to win one of hundreds of rewards cards! Click the link to play now! This post is part of a social shopper marketing insight campaign with Pollinate Media Group™ and PEOPLE Magazine but all my opinions are my own. #pmedia #PEOPLEforOscars http://cmp.ly/3/8vNxcO. Wow evening is a genius! :) Frozen Yogurt, People magazine and a bubble bath! Good work evening! That sounds like what my next Saturday should look like! Ugh that yogurt looks amazing! Now I'm craving some. i do agree everytime i have a quiet night alone i instantly feel pathetic, like i have no friends or am not busy enough. but i'm learning sometimes its nice to put on my pjs and dance around the kitchen making cookies. no judgement here. Sounds like your evening was fantastic! I, too, had a lot planned for Saturday, namely: grocery shopping, house cleaning, grading, lesson planing, resume building. The only ones that got done were grocery shopping (a necessity) and some resume building. I love it when Evenings and Weekends tell you to not do anything! Those are the best nights! i really really love your blog! you are the best writer!! Sounds like a glorious evening! I'm impressed by the fact that you only spent $5 at Target... that's not easy! I loveeeeee nights like this. They are truly the best and you don't realize how much you need one until you have one. Sounds like a perfect Saturday night to me. That sounds like a dreamy night indeed. Your Saturday night looks amazing!!! I havent had frozen yogurt in forever!! That does sound glorious !